This study compares the particular insights found in the passion and resurrection accounts of the four gospels. The core of our faith incorporates both the pain of the cross and the hope of the resurrection into daily living. Ideal as a Lenten/Easter study. 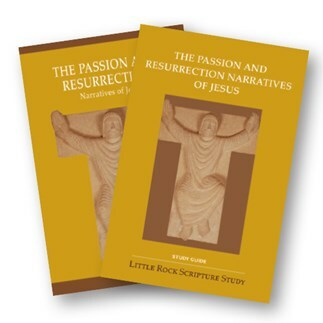 This study has seven sessions, incorporating an introductory session and 6 lessons.The Study Set includes a Study Guide by Stephen J. Binz, and a commentary, The Passion and Resurrection Narratives of Jesus, by Stephen J. Binz. The passion and resurrection of Christ are at the core of Christian faith and form the capstone of each of the four gospels. This study opens Matthew, Mark, Luke and John individually to reveal the special insights each has preserved. Examining the passion and resurrection will challenge you to incorporate both the pain of the cross and the hope of the resurrection into daily living. Many Scripture study groups have found this study to be ideal for Lenten/Easter study. Frequently, these groups will study the passion during Lent (Lessons 1–4), break for Holy Week, and resume study during Easter to examine the resurrection narratives (Lessons 5–6). These lectures correspond to the seven sessions outlined in the Study Set for The Passion and Resurrection Narratives of Jesus.